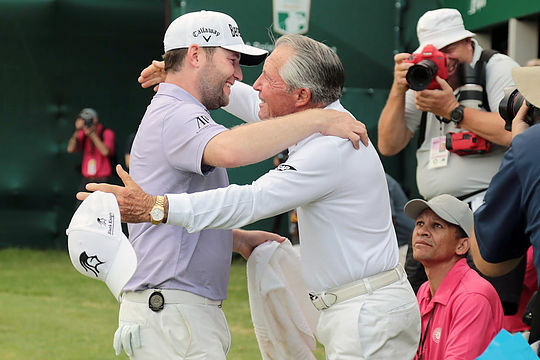 Branden Grace has become the first South African winner of the Nedbank Golf Challenge in a decade at Sun City on Sunday, and South Africa’s greatest ever golfer was the first to jump out of his chair and greet him on behalf of thousands of fans. With a final round of 66, Grace won “Africa’s Major” by a single stroke on 11-under and ended a South African win drought here stretching back to Trevor Immelman’s triumph in 2007. “This is awesome. This is the one event that as a South African you want to win. It’s Africa’s Major for a reason and what a special place it is. There’s a lot of history and a lot of great winners on the trophy and I’m very glad to be able to put my name on the trophy as well,” said a delighted Grace. The South African was involved in a great battle with Scotland’s Scott Jamieson that saw them tied for the lead on 10-under playing the par-three 16th. With so many Nedbank Golf Challenge’s having been decided on this hole, the 2017 edition made for another one of these great moments. After a wayward tee shot that hit the grandstand and bounced back out into the greenside rough, Jamieson almost holed his chip shot from there, which lipped the hole. He tapped in for par. That left Grace with an almost 50-foot putt. And he rolled it straight in to take a one-stroke lead. That was all the lead he needed and he carried it to 18, and into the history books. It was the putt that Player himself voted as his best for the final day. Grace is the seventh winner on the European Tour’s elite Rolex Series this year, and with this being the penultimate event on the Race to Dubai. Jamieson took second place on 10-under with a closing 70 with his challenge hampered by a double bogey 6 on the tough eighth hole – a mistake that proved very costly in the end. Frenchman Victor Dubuisson took third place on 9-under, and China’s Haotong Li stormed through the field with a final round of 64 to finish fourth on 7-under. The trio of Australians at Sun City this week did little to trouble the leaders with Sam Brazel heading the scoreboard in a share of 42nd place at 2-over. Scott Hend had a rollercoaster tournament kicked off by an opening round of 80 to finish at equal 57th with Andrew Dodt claiming last spot at 18-over. The Tour now heads to Dubai for the season-ending $8,000,000 DP World Tour Championship starting this Thursday at the Dubai Jumeirah Golf Estates.